London Fashion Week has just kicked off, and with it, that daily dose of fashion style inspo for your new season wardrobe. Whilst what the designers are showing on the runway is undoubtedly the main focus of the shows, what happens off the runway is just as exciting. Who is wearing what, straight off the runway? Or what’s the hot new brand everyone is talking about? More importantly, which high street style hero is flying off the shelves? Naturally, the trench coat and the checked blazer are still very much staples, but as we’ve come to expect from the London set, it’s all about the daring details. Think super cute micro bags, oversized pearl earrings and statement boots – spoiler alert: there’s a lot of snake print about. Despite autumn being round the corner, there are still plenty of pastels and bright colours about, be it on a floaty dress or a tailored suits. Speaking of suits, this season they’re being donned in all fabrics and colours, from rusty red corduroy to denim, mint green to micro checks a la Clueless. As with anything these days, you have to think about the ‘gram too, and there were plenty of IG appropriate accessories. So far we’ve spotted sculptural statement earrings by the likes of Anissa Kermiche and Mulberry, and re bags, we’ve got micro Regina Pyo, classic Danse Lente, whilst Balenciaga trainers and Neous heels are also having a moment. See some of the most fabulous style moments from the spring/summer 2019 shows in London fashion week. 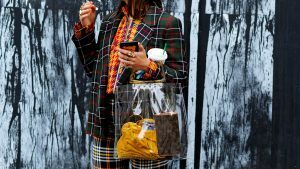 The post London Fashion Week street style: the coolest looks off the runway appeared first on Marie Claire.